Looks like Jay is enjoying it, too! That is one SERIOUS hat, Jason. I don't understand it entirely but it is serious. 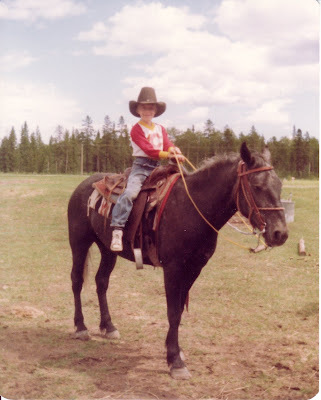 Yes I have been on a horse since then. As for the shirt, it's amazing to what extent people (i.e. relatives ) will go to indoctrinate the next generation of sporting fans. Fortunately at that point in my young life I did not care about hockey. It wasn't until I was more mature and intelligent that I chose the Edmonton Oilers as the greatest hockey team.